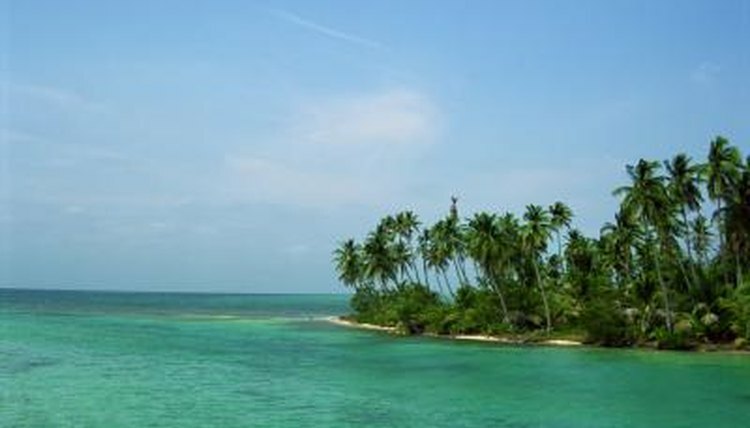 Belize is an idyllic paradise, sharing the setting and culture of both Central America and the islands of the Caribbean. The weather is always warm and the landscape is welcoming, for both tourists and other lifeforms. From the tropical jungles to the sea, Belize provides a perfect home to a variety of native species. This includes the diverse marine life, which brings even more color to the already spectacular environment. With an average yearly temperature of 84 degrees, the sea is often the best place to be and there are many sights to see in the coastal waters of Belize. About a half-mile off the coast of Belize is the second longest coral barrier reef in the world. The reef comes to life with carnivorous polyps that eat small fish and develop a hard outer surface to protect themselves. The coral polyps gravitate toward one another, forming colonies. Their hard shells combine to become the intricate design of the reef. Blue algae live among them, absorbing the coral's carbon dioxide and turning it into oxygen. The oxygen and shelter of the reef create an environment optimal for hundreds of kinds of fish, octopus and other sea life. The reef feeds and houses many species and keeps larger predators in the deeper water. Manatees, crocodiles, whale sharks, turtles and octopus are among the larger inhabitants of Belize's coastal sea and the inland swamps and waterways. Six hundred species of fish and invertebrates live in the waters of Belize. Among them are barracuda, grouper, clown fish, mackerel, parrotfish, snapper, moray eel, angelfish, tarpon and a variety of sponges. Belize has less commercial traffic in its waters, so most of these species are able to maintain healthy numbers. The only endangered species are the larger marine animals poached for their meat and hides. These include: the Morelet's and American saltwater crocodiles; the loggerhead, green and hawksbill turtles and the Antillean manatees. The clear waters, warm temperatures and wide variety of species make fishing a huge draw for both the local economy and visitors. Fishing is one of the most popular and active ways to see the local sea life. The water has a great selection of species for both the sporting angler and the more casual fisherman looking for an easy catch. The more sought-after fish include: tarpon, tuna, permit, snook, bonefish, ladyfish, snapper, barracuda, lobster and mackerel. By law, tarpon, permit and bonefish must be released. Some barracuda, snook, grouper and snapper can be kept and taken back to town for dinner. Visitors can see the varied marine life in a number of ways, including snorkeling, diving, kayaking or glass-bottom boat tours. As Belize is one of the lesser developed countries in the Caribbean, it has the least large vessels, with no freight or cruise ships and few speed boats or jet skis in its accessible waters. This leaves the whole expanse of the coastal waters to be explored safely by visitors in whatever manner they choose to enjoy Belize's vibrant marine life. Kat Toland has worked with animals for over 20 years. She's been employed in the pet industry, but more significantly has been involved in all aspects of rescue, working with cats, dogs, horses, even spending time with rescued wolves. She currently volunteers with a group that runs with shelter dogs. Where Do Sea Bass Live? What Is the Origin of Tilapia Fish? Can a Pajama Cardinalfish Be Kept Alone? What Type of Fish Live in the Yellow River? What Kind of Fish Live in a Kelp Forest? What Kinds of Sharks Are in the Atlantic Ocean? Why are Corals Bright Colors?